The NBA Salary Cap has definitely changed the job of every General Manager into a multi-player chess game. They have to think several years in the future to keep the talent level high and the team salary within acceptable limits. 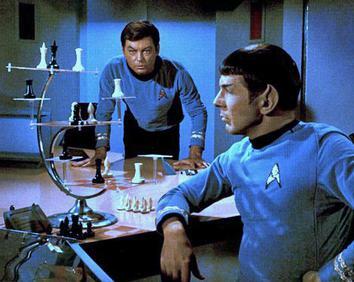 So scratch the multi-player chess - this becomes more like the 30-participant version of Star Trek's 3-Dimensional Chess. And Terry Rozier is one of the pieces. Danny Ainge has generally not been known as a mid-season trader or a rookie-deal extender. Marcus Smart's contract comes immediately to mind. Danny made the qualifying offer - did not trade Marcus before the deadline - waited for any offers from rival teams to come forward - and finally came to a contract agreement with Smart to keep him in the fold. I see the same path with Terry Rozier. Very few doubt T-Ro's talent and determination right now. He has proven himself to be a terrific reserve with the talent level of a starter. Should the Celtics get out of the Eastern Conference Finals and face - let's say - the Golden State Warriors, there is absolutely no question they could use Terry in that confrontation - assuming he is still with Boston and has not been traded elsewhere. In NBA-Manager maneuvering, as in chess, it can be a mistake to look too far, or too many moves, into the future. Ainge is a summer trader, and unless a golden prize, such as Anthony Davis, presents itself, I don't see Terry leaving us in mid-season. Nor do I see an extension coming. Danny will most likely extend a qualifying offer, as he did with Smart, which would place Terry into restricted free agency - thereby allowing Boston to match any other offer, or simply let him walk away - which I also do not see happening. Danny Ainge chose well when he drafted Rozier, and he is not about to let someone with that talent level walk away with nothing in return. So if a large offer is tendered by another team - an offer considered too extravagant for the Celtics - look for a sign-and-trade. That's the way I see it. Terry gets traded only in a deal for a real superstar. But he most likely gets a qualifying offer while Danny waits for the next move by one of the 29 other 3-D chess players.